100’s & 1000’s and chocolate sprinkles to decorate. Pre-heat oven to 180c. Line 2 x 12 muffin pans with cupcake cases. Whisk the cocoa and water in a bowl. Cream the butter, sugar and vanilla in a large bowl until light and fluffy. Beat in the eggs one at a time. In a separate bowl sift the flour, bicarbonate of soda and baking powder. Add half the flours to the butter mixture and fold through. Add half the cocoa water and mix until well combined. Follow with the remaining flour and then cocoa, folding through until just combined. Finally fold through the chocolate chips (optional). Pour the mixture equally amongst the cupcake liners. Place in the oven and bake for approx 25 minutes. Allow to cool in the pan for approx 5 minutes before placing on a wire rack to cool completely. Add the butter, milk, vanilla and cocoa into a mixing bowl and beat until light and fluffy. Add in 1/2 the sifted icing sugar. Beat for approx 5 minutes. Add remaining icing sugar and do the same. 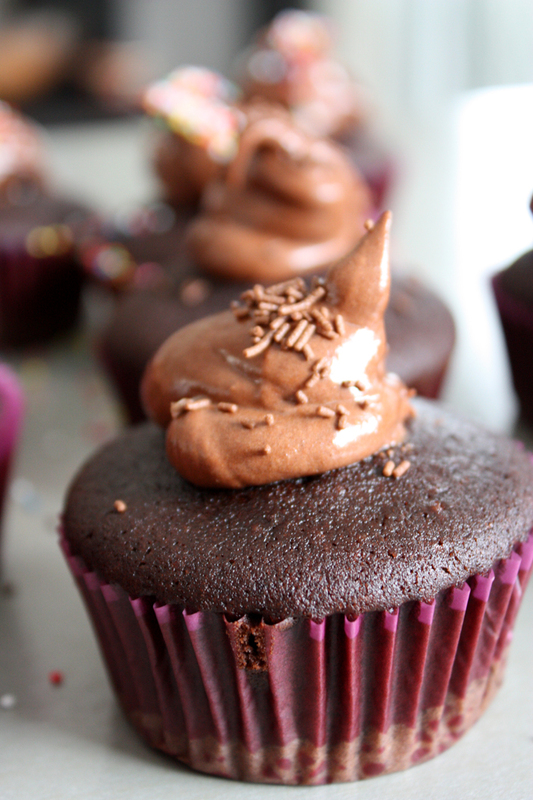 To decorate the cakes spoon the mixture onto each cold cupcake. Spread with a knife or leave as a dollop and decorate. Keep in a cool place or refrigerate for up to 24 hours.